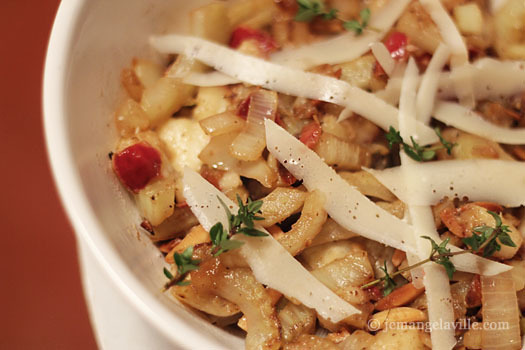 December is Pear Month: Caramelized Fennel with Pear, Almonds and Parmesan plus a Giveaway! If there’s one thing I really enjoy about fall & winter it’s…well, it’s sweaters, actually. But, besides the sweaters, it’s pears. I like them even more than apples. Because of this, I substitute pears for apples in a lot of recipes — pear pies, pear sauce, pear wedges with brie, pears with caramel dipping sauce. In fact, I just made some Parsnip & Pear Pancakes that were completely delicious. Recently, USA Pears offered to send me a whole box of pears to create a recipe for National Pear Month in December. I was so excited I actually came up with two recipes and this one is my favorite: Caramelized Fennel with Pear, Almonds and Parmesan. The fruit really brings out the sweetness of the mellow, caramelized fennel and the almonds and Parmesan cheese just make it more awesome. It’s great as a side dish with chicken or turkey or even just on its own. 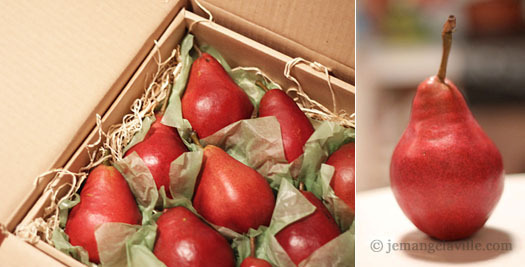 Adding to the excitement, I am also giving away a box of pears from USA Pears! Hooray! All you need to do to enter is leave a comment below. I will randomly pick a winner on Friday, December 7, around noon Pacific time. I’ll get your address and USA Pears will ship the box of pears directly to you. pear nutrition facts (spoiler alert: they are very good for you)! 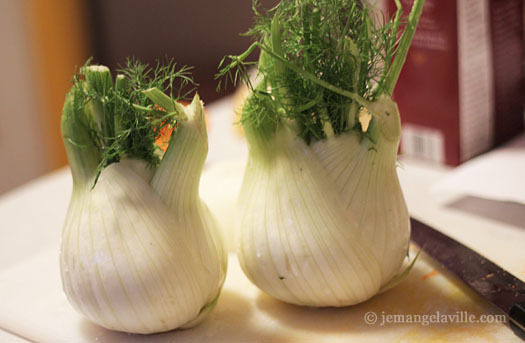 Cut each fennel bulb in half, then in half again. Cut out the core from each quarter. Slice horizontally into strips. Set aside. Cut the shallot in half and remove papery outer coating. 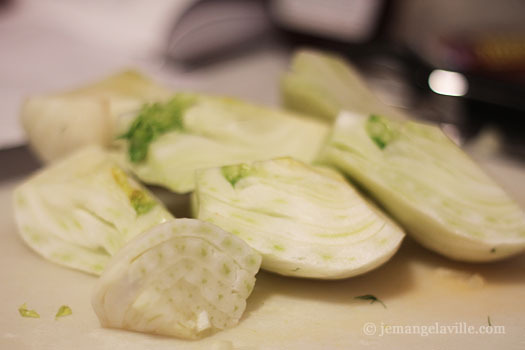 Slice the shallot halves horizontally into strips about the same size as the fennel. Heat a pan over medium heat and add the oil. 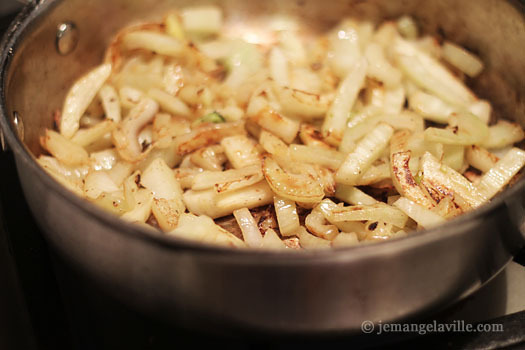 Add the fennel and shallot and some salt and pepper. Cook, stirring occasionally, about 15-20 minutes, until starting to brown and caramelize. 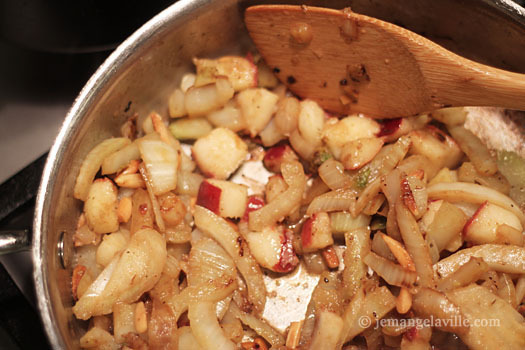 Add the diced pear and almonds and cook for about 5 more minutes. Drizzle with the white balsamic vinegar and taste. Adjust salt, pepper and balsamic as needed. Serve in a large bowl. Garnish with the fresh thyme leaves and strips of Parmesan cheese, using a vegetable peeler to shave off the strips. Winner has been chosen and is being notified! Thanks everyone for commenting! 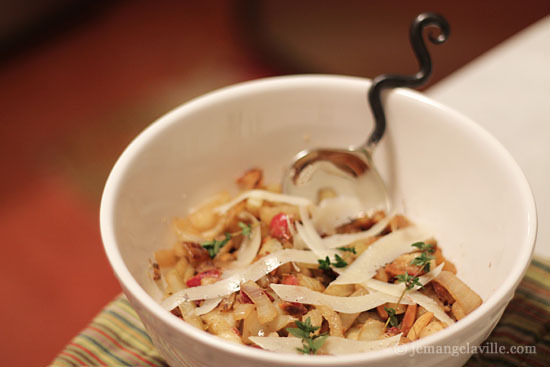 26 comments to December is Pear Month: Caramelized Fennel with Pear, Almonds and Parmesan plus a Giveaway! Pears are my favorite – have been ever since I was a kid. This recipe looks great, but how did you eat it? I mean, it is like a salad or more of a chutney/condiment? We love pears! And this is a great idea for a new spin on their preparation. Oh yum! I have to save this recipe- my pear tree this past year produced like crazy, and this would be so good. Bonus- the pears are ready about the time my CSA starts bringing me fennel! This year I made pear-cardamom jam that was “eat with a spoon” worthy. 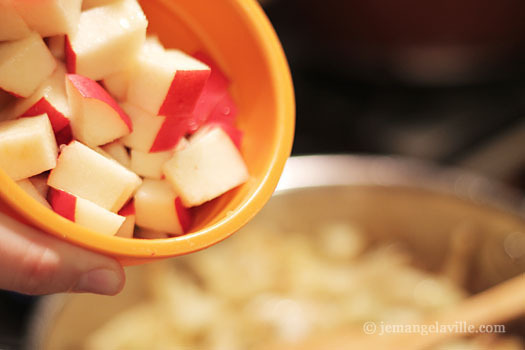 I haven’t cooked with pears, but they are a favorite of mine to eat, and they’re so good for you. Your recipe looks yummy! What a lovely recipe! I’ll definitely have to try this. When I get tired of apples, I go to pears! I just bought a few at the grocery store after reading your post. Looks delicious! Two of my favorite pear dishes are whole wheat pear muffins and pear sorbet. LOVE pears, recipe looks very good! Should the pears be totally ripe, or a bit firm still? When I was pregnant with my second son, I ate pears throughout the entire winter. LOVE them!! How strong does the fennel end up being in this dish? I love it, but I want it as an accent and to often it dominates dishes. My favorite pears are soft, well-ripened Bartletts:) Love them raw, in salad and cooked as jam:) Will definitely try the above recipe, especially since good fennel recipes are so rare. Love pears in our house. My three year old just polished off his second Bartlett of the day and would have had a third if I would have let him! This looks delicious. Are you using white balsamic just for the (lack of) color? Or can the more traditional brown/black balsamic be used instead? I love pears! Esp. in salads with some toasted nuts. Hi Lonni: I used white balsamic because I had some and I really like it (I got it specifically for a recipe awhile back and find myself using it quite a bit)! You could certainly use regular balsamic vinegar, but like you said, that will add a little color. Your pics have me drooling 🙂 And my family LOVES pears, so this post was just about made for me! Pears and brie are a great holiday combo! Looks awesome, Michelle! Pears are definitely one of the highlights of Fall. I love pears. All kinds – and all ways. I like using them in cocktails, cooking with them and even just eating them sliced with cheese. SO happy to live in the NW where we can get so many great ones!